Saint Catherine of Sienna: Weather Alert! Weather Alert! 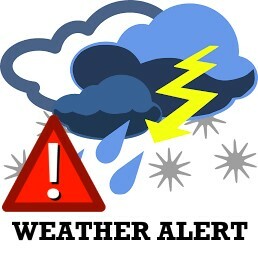 Saint Catherine of Sienna Parish, with concern for the safety of our parishioners and visitors, may at times cancel schedued events, activities or programs and/or close parish buildings due to inclement or severe weather conditions. When we do close or cancel, a "Weather Alert" will be in headline section on our HomePage. The headline will contain brief announcement and clicking on '"Read more" will bring you to this page. More specific details may be posted below as deemed necessary. Thank You! Faith Formation -- Classes are cancelled for today, March 4. Light of Christ Prayer Group -- is also cancelled for this evening, March 4. All other meetings and ministry activities remain as scheduled for today and this evening.